These are veteran recordings which, over the LP years, were often licensed in the West - usually via EMI who issued them singly and also in a boxed collection with The Bells and Kondrashin's wildly resonant account of the Symphonic Dances. The second symphony has been much taken up by many conductors and there are excellent recordings available by Previn (the EMI 197 3 recording is still a top recommendation), Rozhdestvensky (IMP), Temirkanov and many others. These recordings of the Second are distinguished by being complete lasting circa 65 mins. The Svetlanov appears to have cuts although the notes do not refer to them. Niels Høirup is responsible for the reissue concept and can certainly take a bow for this issue and many others in the valuable and rewarding Twofer series. The weakness in this volume is concerned with the decision to split the second symphony across two discs when there was another option. As the notes point out the three symphonies mark out three stages in his career. The first work is a lively, courageous and ambitious work from his student years. The second which is now a popular concert item comes from his heyday maturity. The third and final symphony dates from his years in the USA at the end of his career. After his death and during the 1950s and 1960s Rachmaninov's music was rather deprecated. He was an embarrassment among the cerebral music of those ties. Rachmaninov was an out and out romantic composer. This was equated with sloppiness and sentimentality. His second piano concerto and some of the piano music kept his reputation alive. The symphonies were definitely unfashionable. Although there were recordings made they were not numerous. His return to the fold began with Andre Previn's 1972 EMI recording of the complete second symphony. This classic of the catalogue has been issued and reissued time after time. 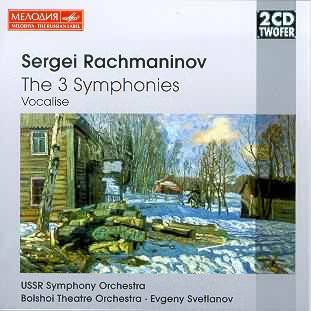 In the USSR in the 1960s the symphonic Rachmaninov (who spent so many years outside his homeland and who died in Beverley Hills) was attracting the attention of the big names including Kondrashin, Rozhdestvensky and Svetlanov. These three symphonies recorded at two yearly intervals from 1962 to 1966 are the fruit of that attention. Kondrashin's recordings of The Bells and the still unmatched Symphonic Dances are coupled on another BMG-Melodiya single CD. Though a different orchestra is used for each symphony Svetlanov is the constant unifying intelligence and emotion. The First Symphony is, like the others, given an enthusiastically dedicated and unembarrassed performance such as must have contrasted with the disastrous premiere conducted by Glazunov. The work inhabits the steppes, oriental fantasy and gypsy campfires of Borodin and Rimsky-Korskaov. The crashing unanimity and pin-sharp focus of attack is characteristic of all three recordings but listen to the finale for an example of this quality. The recordings give every indication of being the pinnacle and culmination of a sequence of concert performances and radio broadcasts, but before the edge of spontaneity and invention had been blunted. The Second Symphony is the best known of the three. It has a Korngoldian splendour and dazzling richness. This is a big symphony playing 54 minutes in this recording but here it is short by about nine minutes shorn from the middle movements. The lambent adagio is the main target for cuts. The Third Symphony has a bubbling effervescently rough energy. Mercurial fantasy and colour light up this symphony. The canvas is narrower than the second symphony but the mood changes are quick and intense. The crashing Easter Fair atmosphere of the finale soon gives place to a determined military theme. The woodwind play in birdsong spasm erupting into a great wallowing theme. The dancing fugal strings (3:31 track 5) are a notable highlight in a symphony which often suggests a concerto for orchestra. It does not have the world-weary romantic epic drive of the Second Symphony. It is more a bloodbrother to the Symphonic Dances of a few years later. The recording is atmospheric although the oldest (approaching 40 years old) sounds the best. The luxuriatingly languid Vocalise is in a version orchestrated by V. Kin. The sound quality is fine; though not exactly subtle it is always exciting. Hiss is undetectable. The recordings, as for all in the Twofer series, is 20 Bit Digital with NoNOISE Remastering, Sonic Solutions Turbo-Bit Mapping. It was sadly unavoidable that one of the three symphonies had to be split across two CDs. The pity is that the one to be interrupted (unless you have a multi CD changer) is the Second Symphony. For artistic reasons I would have selected the less coherent No. 1 and presented No. 2 complete on disc 1 preceded by Vocalise and followed by the first movement of No 1 making a disc of about 76 minutes and the second disc of about 75 minutes. Informatively useful and thoughtful notes by Sigrid Neef in English, German and French. Good artwork and design characteristic of this Twofer series. A space-economical single thickness CD case is used. The set, as with all these twofers, is at mid-price. Raw and lively recordings and performances. The cuts in the Second Symphony register hardly at all in face of such communicative splendour - a quality common to every precious minute on these two discs. Definitely worth getting. This will be a delightful saunter down memory lane for some and a trek of rewarding discoveries for those who have never heard these recordings.